LockCircle BoomBooster, the “freestyle agility” grip handle for Birdcage A7/GH4 system. 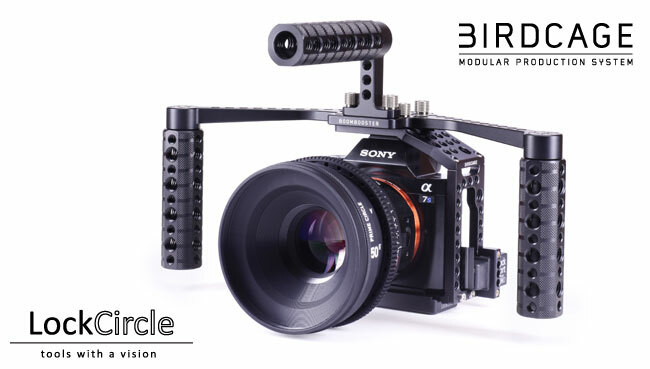 The BoomBooster is the lastest LockCircle addition to the popular Birdcage modular production system available for the Sony A7 (soon A7R II) and Lumix GH4 series. The functionality of the BoomBooster follows the Birdcage ultra-lightweight minimalistic design philosophy introducing the “freestyle agility” concept that matches perfectly the small mirrorless 4K cameras. Innovative shooting skills are introduced by the improved handling / balancing of the BoomBooster design and soon with the 5-axis sensor stabilization a new world of shooting is taking off! 80 1/4”-20, and 34 3/8”-16 threaded holes for mounting leds, microphones, accessories. All the screws are custom cnc machined in high strength titanium.